What do you get a two year old who just had a massive Christmas, for her January birthday? “A Pawty!” Atleast, that’s what she said she wanted while running around screaming at everyone that she’s “two” and holding up both index fingers. 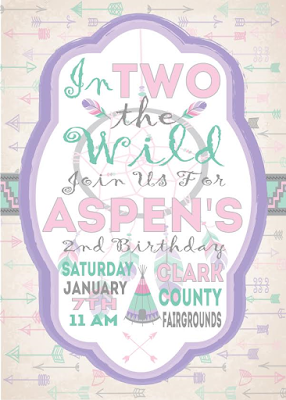 What kind of “pawty” did we settle on for Aspen’s 2nd birthday? 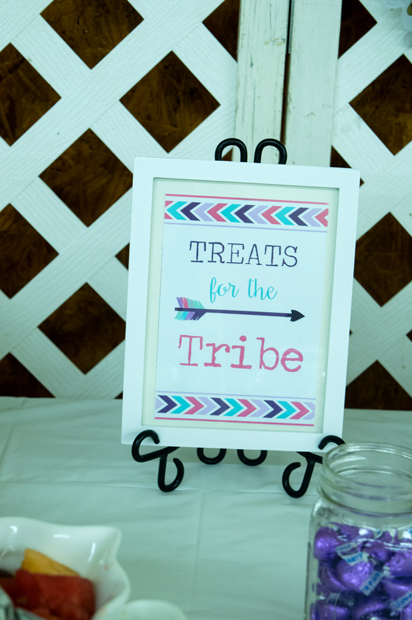 A Boho Chic party filled with teepees, feathers and dream catchers. 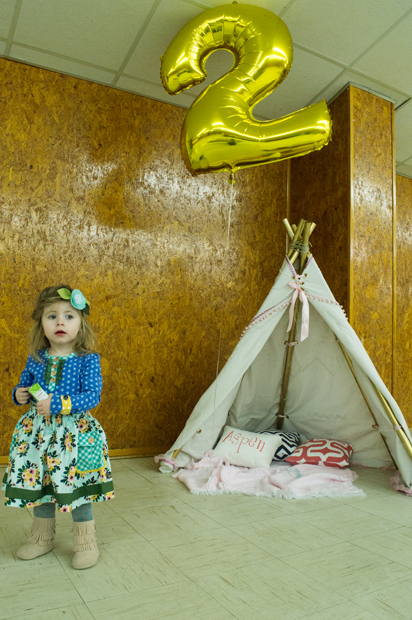 Remember the too-cute teepee Aspen got last year for her first birthday? 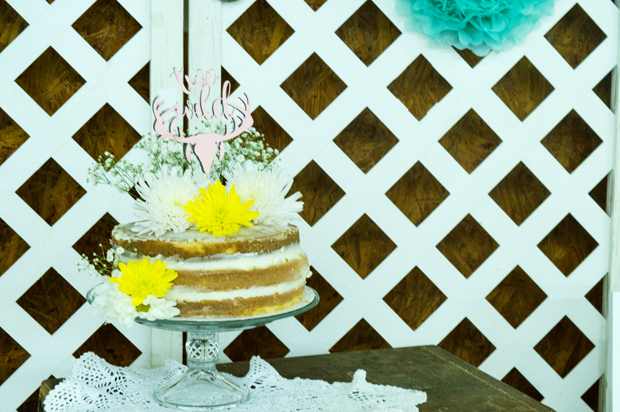 It’s quite possibly her favorite item, which became inspiration for her party theme. 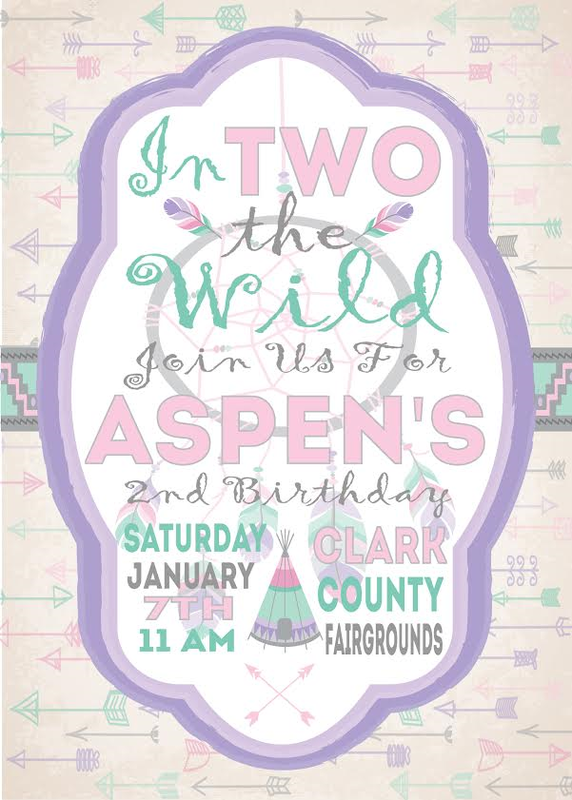 I had a friend of mine create her invitations which we then printed through Walmart.com (I wanted the matte finish which had to be shipped to me.) Make sure you go and check out AM Designs VIP! 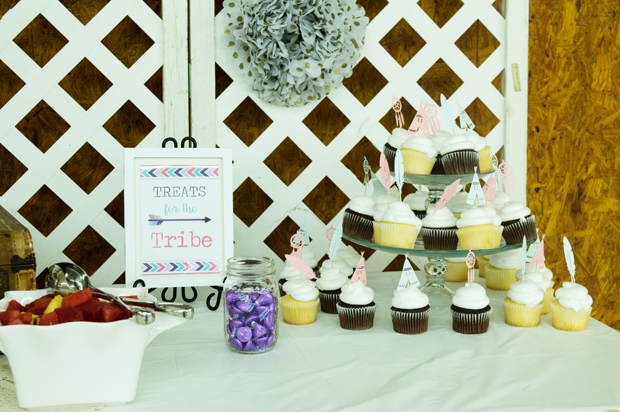 She does some awesome custom party designs. 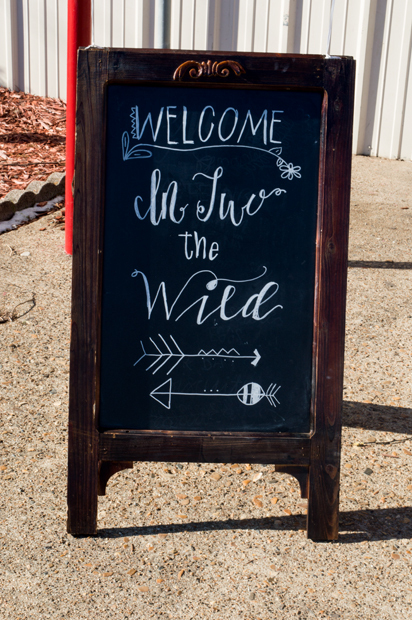 For the party venue, we rented a building at our local fair grounds to host our 40+ invited guests. After cramming all of our guests into our house last year, I wanted a more open space with more seating. Since we celebrate in January, anything out doors was out. Especially when the temperature was as low as this past weekend. That left very few options for us to chose from, but we made do. 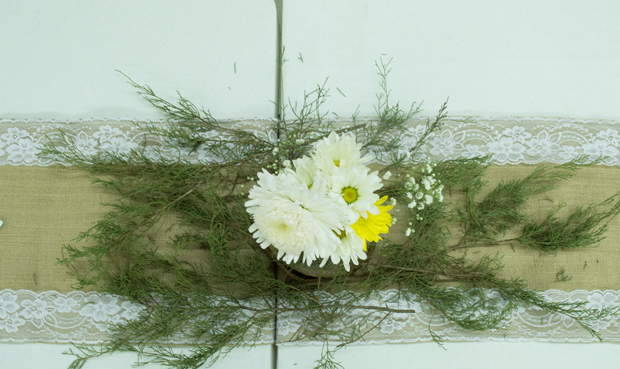 I used the same flower concept to create the swag along the backdrop. I finally learned that those things are called swags. Apparently if you call them spray’s when googling the idea, you come up with funeral flowers. I used Crafted Sophistication’s tutorial on making the crepe paper garden roses and used a mix of pink and cream along with the peony’s. 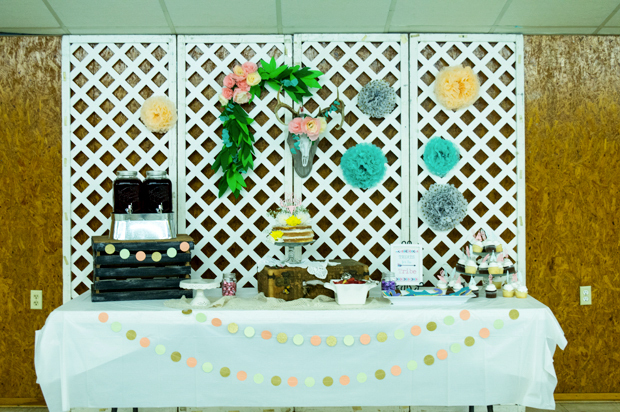 I also added mint, peach and polka dot gold poofs along the backdrop which I found with this kit on Amazon for $20. 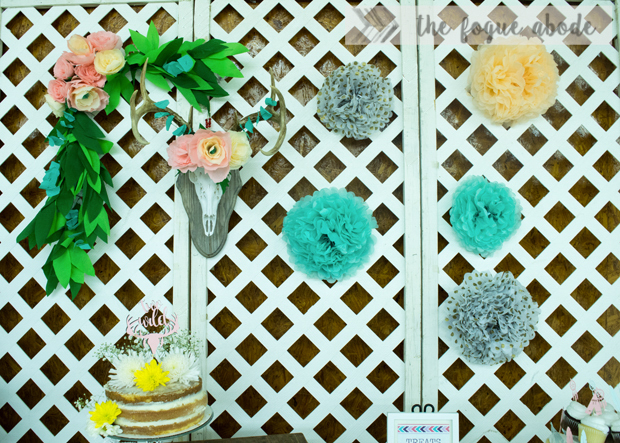 It included the poofs, the garland and the streamers. Can we discuss the cake? 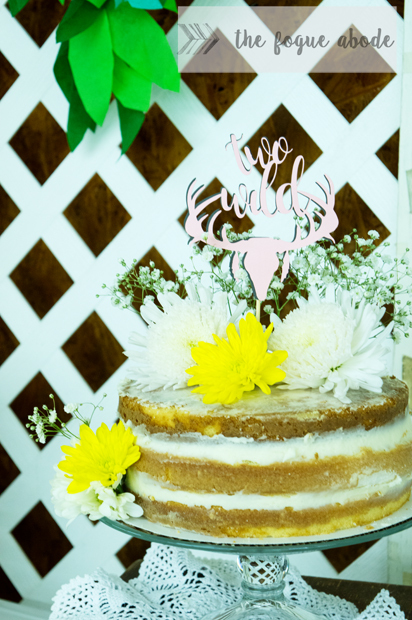 I am infatuated with naked cakes. 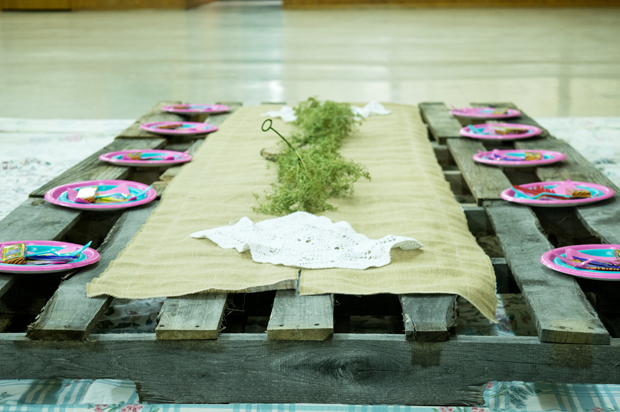 They look so rustic and well, bohemian. I knew that this should be the birthday party cake. And totally DIY-able. 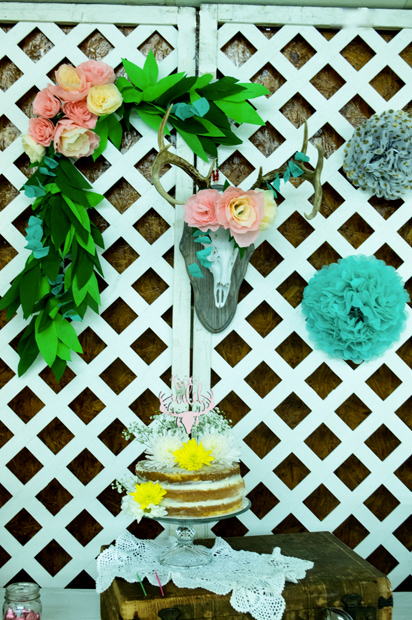 All I had to do was add the flowers and the cake topper. 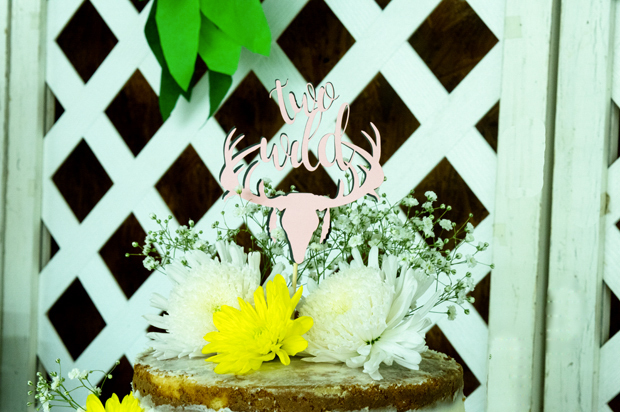 I made this cute “two wild” cake topper with a pink and a charcoal piece of cardstock, a wooden skewer and a Cricut Explore Air™ machine. It was totally simple to make using the Cricut Design Space™. 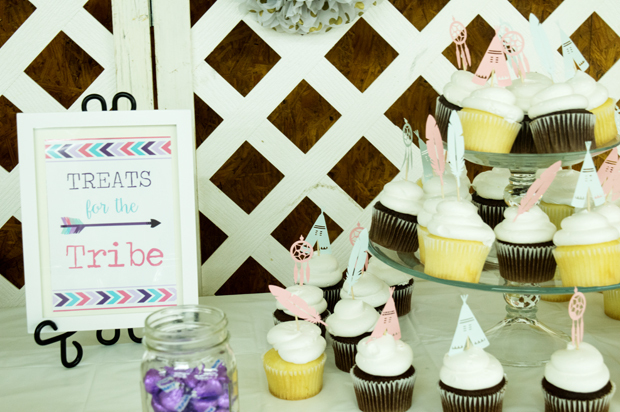 I was also able to make the cup cake toppers with toothpicks and Cricut cutouts. I ordered a few plain vanilla and chocolate cupcakes from our local grocery to go along with our cake. 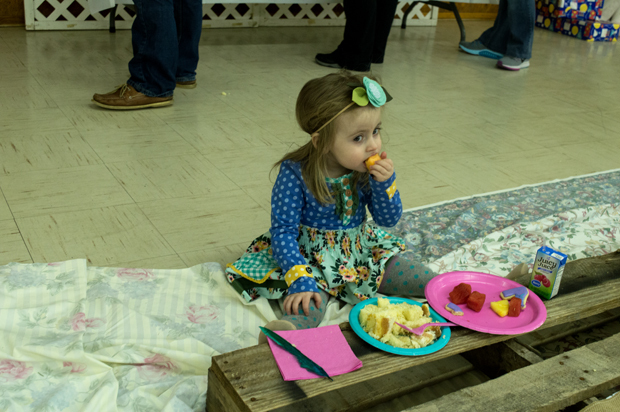 In addition to the cake and cupcakes, we just served fruit, cookies, made by Sugar Belle Sweets, and macaroons. 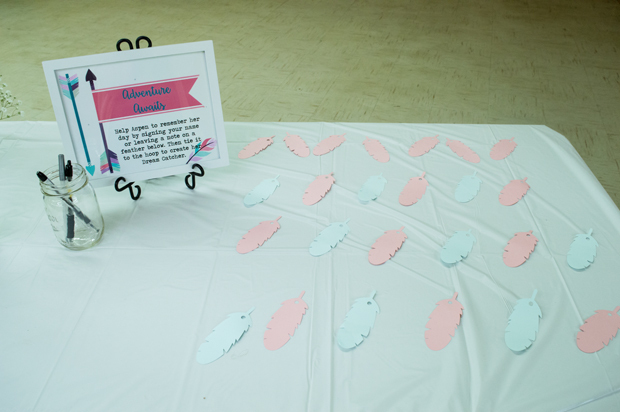 I really liked having an easy-peasy menu set up this year. After serving brunch for last year’s party, which was so much fun but exhausting, I wanted to have a simpler plan this year. Table set ups were much easier too this time. 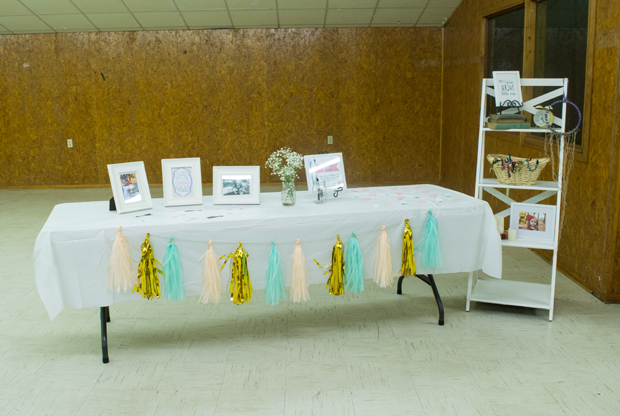 I loved having more space to really spread some tables out. 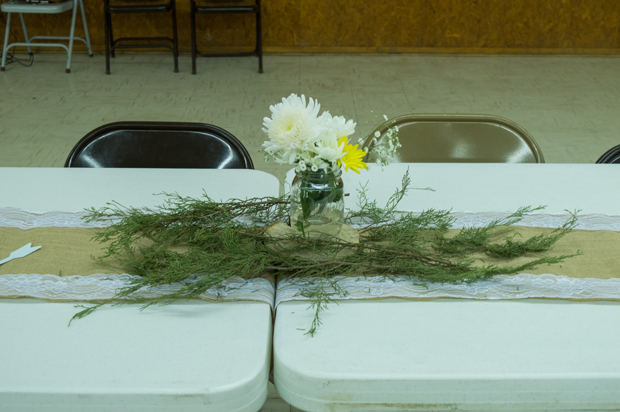 I used a simple burlap runner, some cut-offs from a tree in our yard and a grocery store flower arrangement. I wanted to give the kids a special place to sit. 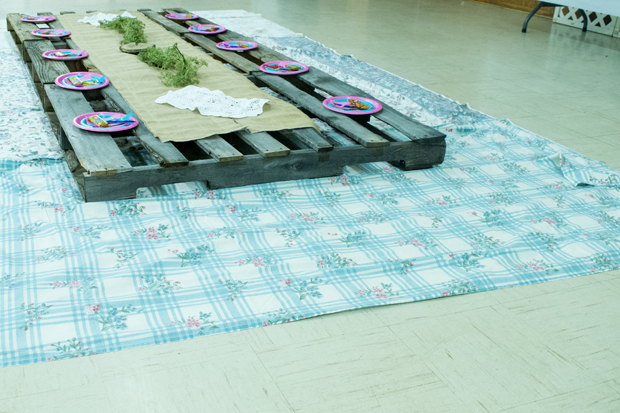 So, I used 3 pallets laid out on fun granny floral sheets that I borrowed from my mom to give it that authentic boho feel. 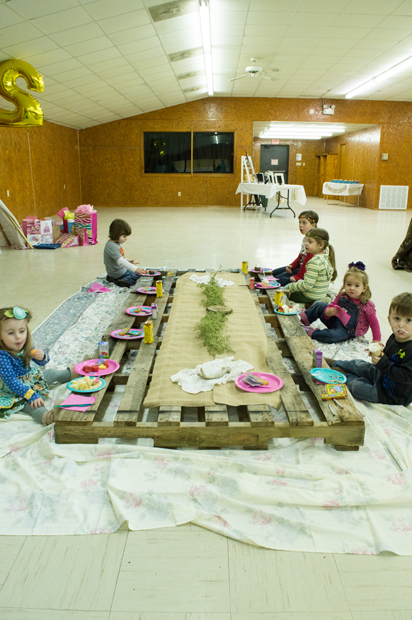 This became the kid’s table. 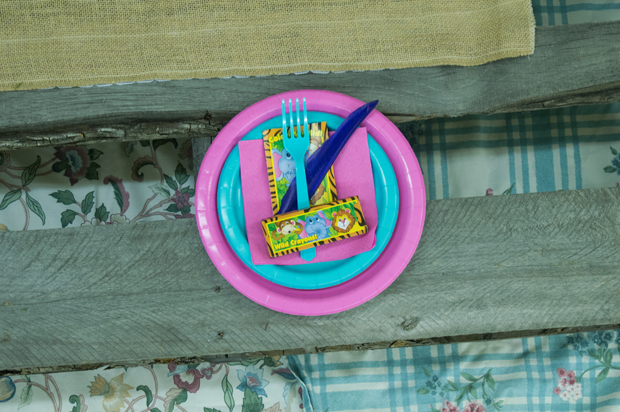 Each place setting included their plates, utensils, juice/yahoo and a coloring book and crayons. Moving on to the front table, I wanted to really show off our birthday girl. As Aspen’s guests arrived, we had this table set up. One tradition we started last year was leaving notes and wishes for the birthday girl. 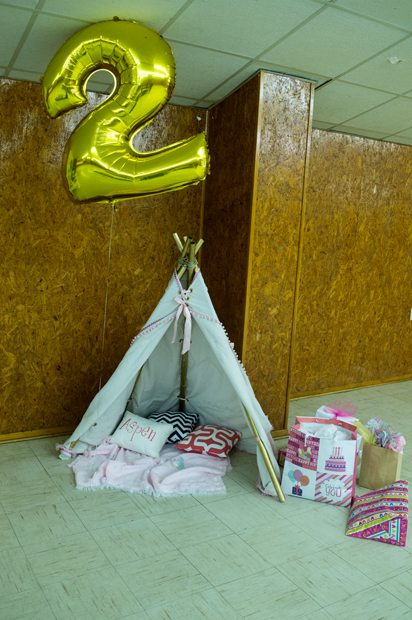 Last year, we used hearts which went with her Sweetheart birthday theme. This year, I cut out feathers and we strung them to her dream catcher. 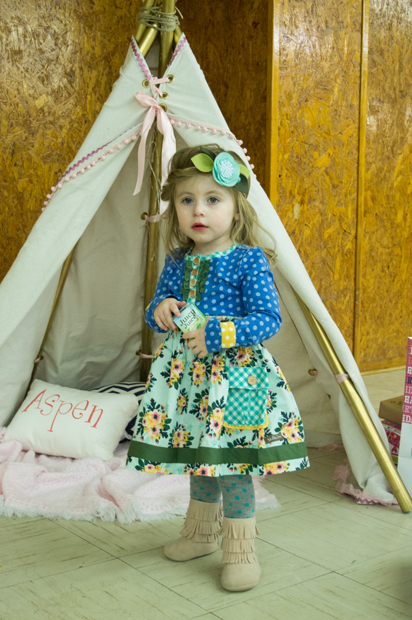 In the basket on the middle shelf, we had flower crowns and feather headbands for all of Aspen’s tiny guests. 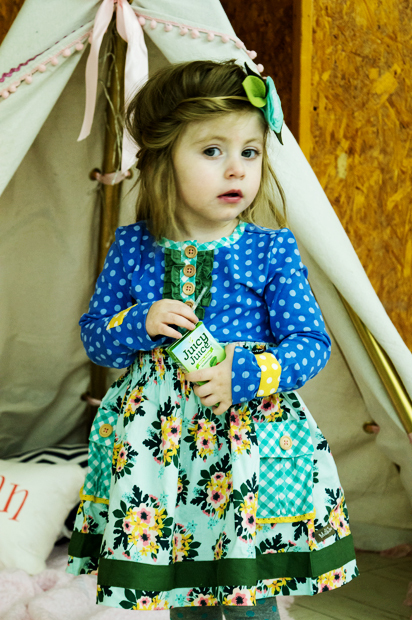 It was so cute seeing all the little Boho babes running around. The boys even loved their Indian feather headbands too. 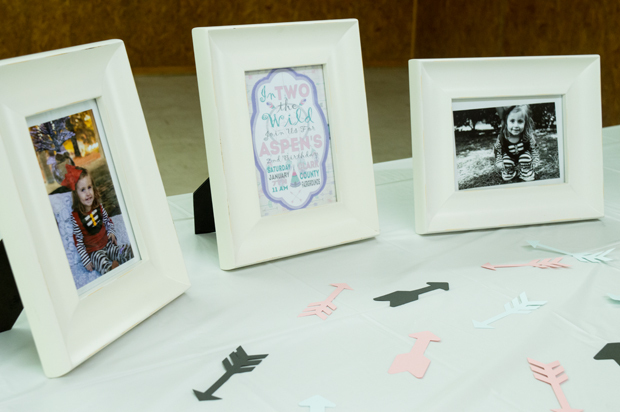 All of the framed signs I made using my Photoshop Elements 14. 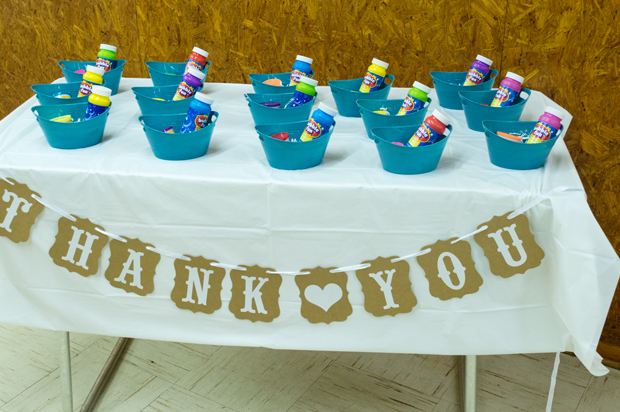 As a thank you for attending the party, Aspen gave each of her guests fun little buckets full of her favorite things: bubbles, play-dough and whistles. I got these cute mini buckets at the Dollar Tree which made great treat bags. The whole day was such a hit. 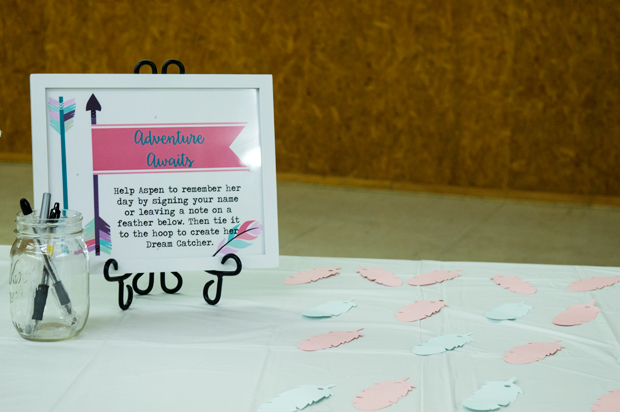 I didn’t even sob once…well not at the party at least. I really can not believe that my little baby is two already. I know that’s such a cliché thing to say. But being a mom, it’s never been more true. It is such a joy just enjoying life with her right now. Ok, enough with the sappy stuff before I start crying again. 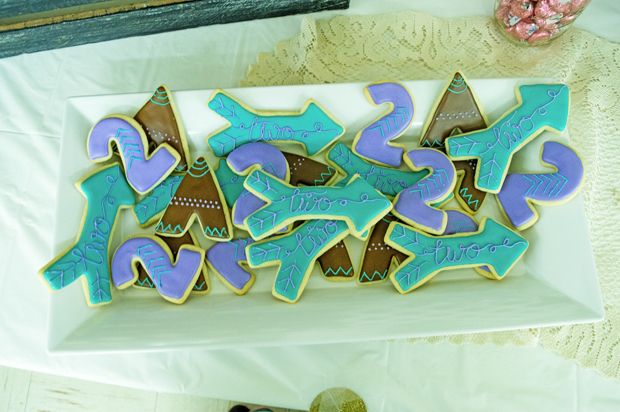 Here’s a few more pictures from the party, this time with all the pawty-people! Very cute, I love her dress! Thank you, it was my splurge but totally worth it. Seriously so cute! She looks adorable. You really did make the day so special for her with all the extras. 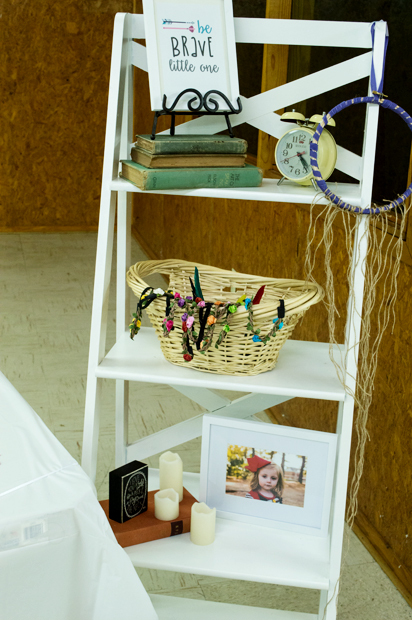 The dream catcher and their own table. 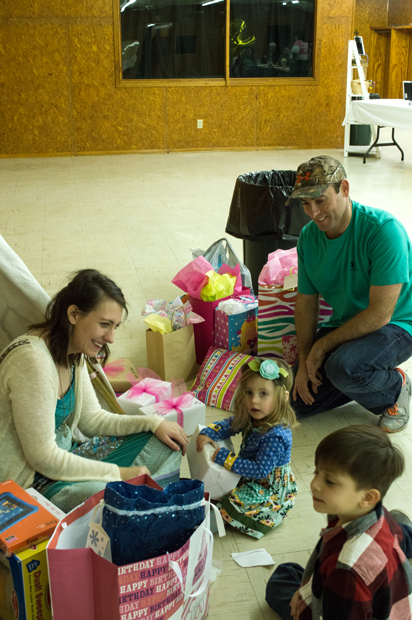 Looks like everyone had a blast! Thanks for checking it out and the seriously sweet comments!